Evidenced by the tremendous smile on his face and his new focus on brewing creativity, Kevin McNerney seems elated to now be a part of the 5 Seasons brewpub family. The former Sweetwater brewmaster and co-founder took on the brewing duties at 5 Seasons Atlanta (5600 Roswell Rd. NE in The Prado) after brewer Glen Sprouse left the 5 Seasons brewpub early last fall to pursue other career opportunities. McNerney's departure from Sweetwater came late last summer, and the news took the Atlanta beer scene completely by surprise. Years of long brewing days and the constant stress of managing the intricacies of a large, regional, craft brewery took their toll on McNerney. "Twelve successful years have gone by quickly, and I am extremely proud of the accomplishments of Sweetwater Brewing Company as the major microbrewery in the southeast," said McNerney after his resignation. "What started in 1996 as a dream has grown significantly to the large entity it is today, thus becoming more than I'm willing to manage at present." McNerney trained in the early 90s at Rockies Brewing in Boulder Colorado before moving on to Avery and then to Mammoth Brewing in California. While in California, he participated in brewing courses at U.C. Davis and then headed to Atlanta in 1996 to begin efforts with partner Freddy Bensch to open Sweetwater. Atlanta embraced Sweetwater immediately, and the brewery's phenomenal growth (30% for 11 out of 12 years) ranks among the best of any craft brewery in the country. McNerney, very proud of this achievement, states, "That was my objective - significant annual growth in building a major southeastern regional brewery. That goal was achieved, and now I have a whole fresh batch of goals. I had a taste of growth and I feel a sense of fulfillment but now want to take the pace of my life down several notches to be happier and a better husband and father. Bigger is not always better. The smallness of 5 Seasons makes me happy. My family is very important to me, and it's great that they can pop in and visit me here. My stress level is much lower." McNerney wishes Sweetwater continued success. "I made sure that the quality of the beer stayed great. We put an excellent quality beer in people's hands, and word-of-mouth marketing is priceless to Sweetwater. I do have a reputation for being a hard worker and being responsible, and I’ve often cursed that diligence because it kept me at Sweetwater for 12-13 hours a day. It was my own fault, because I couldn't go home and sleep well unless I knew things were okay at the brewery - it was important for me to be the leader of the flock." McNerney enjoys the fact that the brewpub environment of 5 Seasons now affords him creativity and the chance to try different recipes and a variety of ingredients. "It's also fun being interactive with the folks at the restaurant, and I'm pleased to see my following from my Sweetwater days coming into the brewpub. This job switch was really meant to be, because two weeks after I left Sweetwater, Glen resigned, and the brewer position was left vacant. I live just about a mile from The 5, so for me to have an opportunity to brew for my favorite local beer joint was an easy decision. This is an environment I'm very comfortable with, and it's a welcome relief to have a small brewhouse and only be responsible for one thing - getting good beer on tap." "Kevin has brought some fresh excitement and energy into the place," remarks 5 Seasons host and co-owner Dennis Lange. "We've started doing free brewery tours on Thursdays at 5:55 PM - patrons can get a pint glass, see the brewery operation and sample our beers. Kevin has made the tours really popular so far. Glen was an extremely talented brewer who specialized in German lagers and Belgian ales, but Kevin's all about bringing some West Coast style ale varieties. His first beer here was a fantastic IPA called Hopgasm - released at a big party last November 12." McNerney adds, "I was delighted and proud of the way the Hopgasm turned out - it has grapefruity, citrusy West Coast character and aroma, mild bitterness and lots of hop flavor from Bravo, Amarillo, Columbus and Simcoe hops." 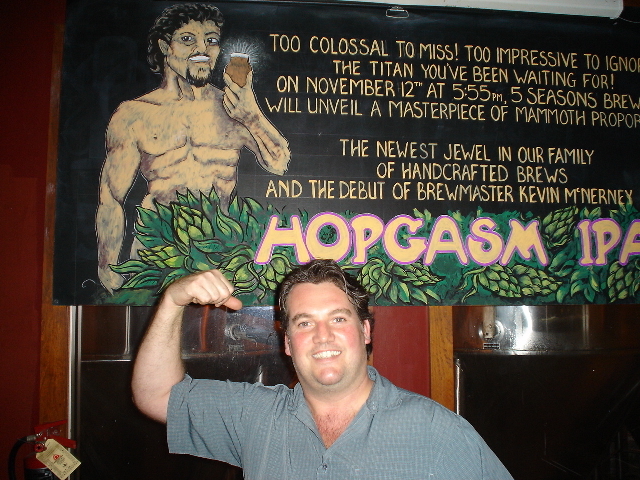 McNerney utilized a creative, "hopback" styled process while brewing Hopgasm. He took the batch of beer from the brew kettle, ran it through the heat exchanger, cooled it to 175 degreed F, added more hops into kettle and ran the beer back to the kettle. "Adding late hops while the beer is at a cooler temperature keeps the volatile hop oils intact. I did six hop additions for this 7% ABV IPA and wanted delicious hop complexity to really shine through." Luckily enough, before departing from 5 Seasons Glen Sprouse took about a week with McNerney to work through the ins and outs of the brewhouse and make batches of Kilt Lifter Scotch Ale, Seven Sisters Munchner and Helles. McNerney adds, "Glen was very helpful in showing me the eccentricities of the system and providing an ongoing source of support. The brewing facility at 5 Seasons is top-notch and more advanced than your average brewpub system - easily in the top 10% in the country. Glen put a lot of miles on it, but it was designed extremely well with a considerable amount of automation, touch screens, thermocouplers and an efficient racking mechanism." McNerney sees 5 Seasons as being special in many ways. "I like the fact that the beers and the food greatly complement each other. I’m intrigued with the culinary arts as much as I am with beer, and 5 Seasons takes their menu very seriously. I love being able to sit down to lunch each day at 5 Seasons - the kitchen gets excited about the beers and I get excited about the food. I couldn't make tripels, Scotch ales and barleywines if this were a hamburger joint. I'm also excited to see these guys emerge from the bad situation with all the surrounding construction for the past year and a half. Most businesses would not have survived, but 5 Seasons made it because of its outstanding reputation and quality. This brewpub’s going to be around for a long time." "After months of disruptive construction surrounding the brewpub, customers are finding out that we are now accessible and there is parking. Life here is good again," reports 5 Season's Dennis Lange. "Kevin's bringing in lots of new customers too - he has so many fans who have enjoyed his work over the years, and these followers have now been discovering 5 Seasons. We wanted our new brewer to be very experienced and have ties to our local community." Whereas typical microbreweries commit themselves to constant production of a small range of beers, 5 Seasons allows McNerney the flexibility to create a wide range of styles and unique brews. "My intention is to keep the successful brands that Glen has been doing - our customers demand this, but I also look forward to concocting several recipes of my own, experimenting with aging of beers in oak, adding special ingredients and trying out new procedures. I even have plans for a very special collaborative beer with Avery Brewing Company, so keep an eye out," remarks McNerney. Local beer aficionados should also mark their calendars for the release celebration of McNerney's bourbon barrel aged Scotch ale on February 25 at 5:55 PM. 75 participants will enjoy this fine ale alongside selected food items. McNerney adds, "I have so much excitement for the style - this Scotch ale is going to be really good from the barrel - just malty enough for the flavors of the barrel to shine through for nice complexity. I've collected some Jack Daniels and Wild Turkey barrels to play around with - I can't wait." McNerney seems to have found a rewarding new life and comfortable setting at 5 Seasons. He quickly points out that his wife and baby girl have been grateful beneficiaries of this career move. His second little girl is due in January, and he couldn't be more thrilled. "I enjoyed helping build a big brewery, but being a father is the best - the giggling, smiling and joy I see on my daughter's face each day is adorable. That kid is amazing." The 5 Seasons brewpubs in Atlanta and Alpharetta, Georgia exude personality. The welcoming staff, warm atmosphere, scrumptious Euro-Asian food menu and outstanding range of house beers combine to create an unrivaled brewpub experience that has become an essential ingredient of the vibrant, local beer scene. In 2001, experienced restaurateur Dennis Lange and chef David Larkworthy combined their talents to open the original 5 Seasons in The Prado shopping center of the Atlanta suburb of Sandy Springs. Customers cherish Lange's welcoming and entertaining personality, Chef David's upscale food items are conceived and implemented with passion, and the entire 5 Seasons staff never fails to communicate the joy that comes from being a part of this brewpub's family. The 5 Seasons experience of late has also involved substantial, and sometimes stressful, transformations. The resignation of their long-time brewmaster, along with massive, disruptive construction surrounding the original brewpub created a number of challenges for the co-owners who were already hip-deep in efforts to open new locations. Up until this year, experienced brewmaster Glen Sprouse cranked out elegant lagers and ales at the original 5 Seasons. When Sprouse departed to explore new career opportunities, Kevin McNerney, the former brewmaster and co-founder of Atlanta's largest craft brewery (Sweetwater Brewing Company), took charge of the 5 Seasons brewhouse. After 12 years of working extremely hard to help build Sweetwater, McNerney decided it was time to downsize and devote more time to his wife and children. "5 Seasons has always been my favorite brewpub, and I live only a mile away. Taking over the brewing duties here from Glen was an easy decision, and it's a welcome relief to now have a small brewhouse and only be responsible for one thing - getting good beer on tap. I’m a 17-year brewing veteran and am glad that the guys at 5 Seasons decided to hire me - they wanted someone with experience and deep ties to our local beer community. Fans from my Sweetwater days have followed me to 5 Seasons and brought some fresh energy." McNerney's first beer at 5 Seasons, appropriately called Hopgasm, is a big IPA packed with flavor and aroma hops. "I love hoppy beers, and Hopgasm made me proud," says McNerney. "It has grapefruity, citrusy West Coast character, mild bitterness and lots of hop flavor from Bravo, Amarillo, Columbus and Simcoe hops." To provide a more intense and complex hop presence, McNerney ran the final wort through his heat exchanger, cooled it to 175 degrees F, added more hops to the brew kettle and ran the wort back to the kettle. "Adding late hops while the beer is at a cooler temperature keeps the volatile hop oils intact," explains McNerney. Quite advanced for a brewpub system, the 5 Seasons brewhouse ranks as one of the best in its size class in the nation. Extensive automation, touch screen monitors, thermocouplers and a highly efficient racking mechanism make daily brewing chores a pleasure for McNerney and will allow for a great deal of creativity. "My biggest challenge here has been in learning this new system. There are no two systems exactly alike - the brewing theory is the same, but I had to quickly adapt my brewing knowledge to the mechanics of this system. My intention is to keep the successful brands that Glen has been doing - our customers demand this, but I'm also exited about creating some new recipes, experimenting with oak barrels, adding special ingredients and trying out new techniques," adds McNerney. Patrons and staff agree that the beer and food at 5 Seasons are among the best of any brewpub in America. "I’m intrigued with the culinary arts as much as I am with the brewing arts," says McNerney. "Chef David takes his menu very seriously here, and the kitchen and brewery really complement one another. The kitchen gets excited about the beers, and I get excited about the food." Chef David Larkworthy's passion for food shines through on a menu highlighted with local produce, all-natural meats and artisanal cheeses. "We bake each of our breads and make everything else from scratch. We believe in conserving the spirit of the farm and supporting local farmers. The basic idea is to get the best possible ingredients and try not to f**k them up!" However, the last two years haven't been all bliss for the original 5 Seasons. A corporate development company purchased the shopping center and instituted major construction projects involving the parking facilities and surrounding businesses that seemed likely to engulf and suffocate the brewpub. Automobile entry, maneuvering and parking became a nightmare for patrons. The desperate 5 Seasons owners even began a lawsuit against the developer. But in the fall of 2008, construction began to near completion, surrounding businesses and parking opened up, and the environs vastly improved for 5 Seasons. McNerney explains, "This brewpub survived purely on the outstanding reputation they have for the quality of the food, beverages and fun atmosphere. Dennis knows most of the people who walk in the door and understands what makes them happy. These customers never abandoned the brewpub for a second, and we love the breath of fresh air that’s come to the place with the new shopping center - fresh faces come in now who never knew the brewpub was here." In 2007, Lange and Larkworthy teamed with an old friend, Crawford Moran, to establish a second 5 Seasons brewpub in the northern suburb of Alpharetta. Moran, the former owner/brewmaster of Atlanta's defunct Dogwood microbrewery, loves the creative freedom and customer contact of a brewpub setting. "I brew a ton of beer styles at 5 Seasons North, tap a unique cask ale each week, offer a high gravity beer on tap at all times and experiment with aging in oak barrels. I get to interact with our customers concerning the taste and character of each beer - it's great fun." 5 Seasons also recently announced plans to open their third location, 5 Seasons Westside, in a redevelopment of a beautiful 100 year-old brick structure near Midtown Atlanta. Covering 17,000 square feet with three floors, three separate bars, three private events facilities and abundant outdoor seating, this 5 Seasons location will become the largest brewpub in the Southeast. Crawford Moran plans to man the brewhouse here along with the Alpharetta facility. Dennis Lange sports an enormous grin when he says, "5 Seasons is that little neighborhood joint that happens to seat more than 300 people. New customers see friendly faces not only in the loyal staff but also in the many regular patrons who seem to always be here. You get a good value for your buck at 'The 5' - extraordinary fare and drink. There's always a special event or something new to try, and you'll be treated like a human being, not a nameless somebody." More than 42 styles of beer have been produced since opening. More than 65 styles of beer have been produced here since opening. Howell Mill Rd. at Marietta St.